What follows is a brief exploration of Izapan iconography and orientations in the light of horizon astronomy. This material was first published in a lengthy monograph (Izapa Cosmos, 1996) and later incorporated into my book Maya Cosmogenesis 2012 (1998). Since these publications I have felt that Izapan iconography and astronomy needed more attention, and perhaps supportive illustrations and diagrams would be helpful to illustrate what we find. In this brief recapitulation, I will focus on the monuments of Group F, for they clearly suggest something profound and unrecognized about the Izapan awareness of astronomy. Stela 25 also contains a recognizable Popol Vuh episode, in which Hunahpus arm is torn off by Seven Macaw. Since Seven Macaw is identified with the Big Dipper of the polar region, I suggested (1996, 1998) that the fall of Seven Macaw involved the demise of an old cosmological system centered upon the polar region. The shamanistic concern with knowing where the center of the sky is located is central to understanding this cosmological shift. The shift, after Seven Macaw was done away with, was to an opposite orientation, as revealed in the diagram above. The dialectic sets the head of the alligator in opposition to Seven Macaw. This alligator-head is the location of another cosmological center of the skyit is the location of the center of our Milky Way galaxy. (Note: I am omitting arguments and citations that can be found exhaustively documented in my book Maya Cosmogenesis 2012). Generally, this monumentas well as many others from Izapa; e.g., Stela 11 indicate an interest in the Milky Way, the dark-rift in the Milky Way (the mouth is the dark-rift), and the Big Dipper. 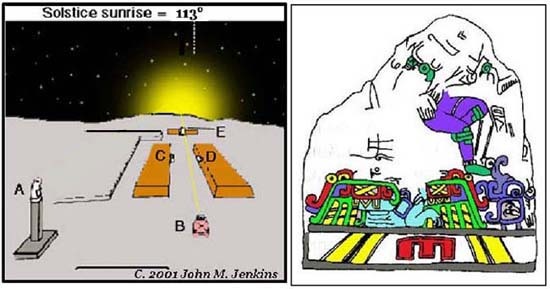 Im skipping over many related issues now to move right into the monuments of Group F. My basic idea is that the content of the monuments cannot be fully understood unless we take into account the sites orientation, local topography, and horizon astronomy. These factors will be particularly significant for understanding the Group F monuments. First, lets zoom into Izapa by leaps. 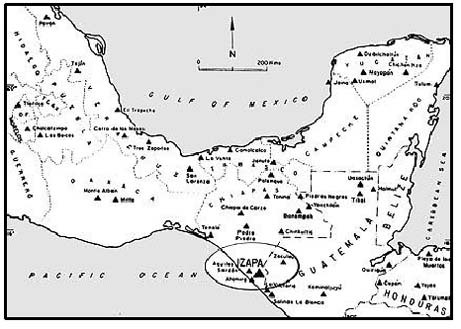 Above we see Izapas location in southern Mesoamerica. Next we zoom into Izapa more closely and see that the site is located between two extremes of nature: mountains to the north and ocean to the south (left, above). Next, we see the site plan. The site is oriented some 21° east of true north, which is the sight line to the peak of Tacana volcano. Also significant, the perpendicular to this main axis is sighted on the December solstice horizon. Many monuments (e.g., Stela 11 in Group B) face this horizon. 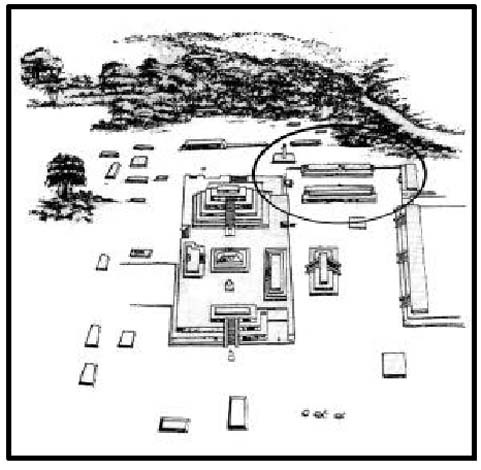 In the diagram above right, we see the Group F ballcourt on the north end of the site. We will need to zoom in even closer to see how the lengthwise axis of the ballcourt, barely discernable here, is oriented to the December solstice horizon. Note: we are omitting additional supportive evidence in Groups A, B, and E for the thesis I will present. Still oriented with north at the top of the diagram, we see Group F. The significant monuments, found in situ, are located in the ballcourt, indicated by the circle. Archaeological evidence indicates activity in this group occurring later than Izapas central groups, perhaps the first or second century AD. Here and elsewhere, even post-Classic activity has been identified. However, this doesnt mitigate against the astronomical implications of the monuments that we find here. Whenever they were placed there, by whomever, the same interpretation applies. The monuments that we will now look at were located by Brigham Young University, found in situ. One of these monuments, a throne, faces the December solstice horizon. In addition, the entire lengthwise axis of the ballcourt is oriented toward that horizon. A. Sitting figure on pillar facing solstice sunrise. B. Throne 2; a snake-mouth ballcourt marker; ball and goalring stones. C. Stela 67, period-ending solar lord in Milky Way canoe. A close-up view of the monument at position A will not be illustrated; it portrays a crouching figure on top of a pillar. Despite it's broken condition, it is clear that the figure faces the southeastward solstice horizon. The monuments at position B include Throne 2, a ring-and-ball, and a serpent head with open mouth that was originally a ballcourt marker stone. We will illustrate these shortly. First let us look at the stela located at position E, on the east end of the ballcourt. If you sat on Throne 2 at the west end of the ballcourt, you would look out over this stela, toward the December solstice horizon. Stela 60, portrayed here (above right), is the one at position E in the diagram (above left). Although eroded, it is clear that it shows a victorious ballplayer, probably one of the hero twins, standing over a demised Seven Macaw bird deity. This indicates to the viewer two things: the former god, now defeated, and the new god, newly victorious or newly born. This scene relates to the Creation myth wherein the hero twins must defeat the vain, false ruler of the previous world age, Seven Macaw, before their father, One Hunahpu, can be reborn. A lengthy examination of early Measoamerican calendrics is omitted here, which demonstrate that One Hunahpu was probably associated with the December solstice sun at Izapa. The ballcourt scenario just reviewed confirms that separate argument. (Note: this is a pre-Classic identification.) 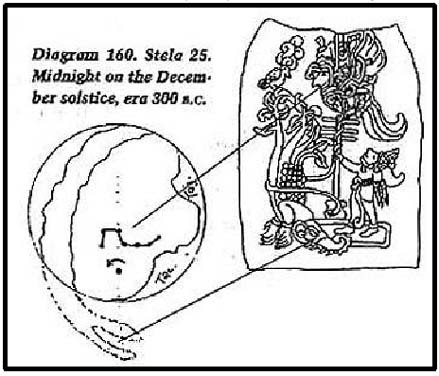 And, of course, it neednt be emphasizedbecause we can see it in the diagram abovethat the December solstice sun rises over the stela depicting the demised Seven Macaw. This basically says: the polar god is dead, the solar god is born. However, the solar gods rebirth is inextricably involved in its future alignment with the Milky Way more on this follows. Here we see the Milky Way converging with the position of the dawning December solstice sun in a process caused by the precession of the equinoxes. This is a very significant fact: the horizon which we are examining is where a precession-caused convergence between the Milky Way and the December solstice sun has been occurring for thousands of years. Fact: The solstice solar god and the Milky Way align in the years around AD 2012. Astronomically said, the solstice meridian will align with the galactic plane. Is it a coincidence that the designers of the Group F monument arrangements were interested in the horizon along which this convergence occurs? Perhaps. But lets look now at the two monuments found at locations C and D. These locations are midway along the ballcourt, half-way between Stela 60 and the Throne 2 monuments. It is an astronomical fact that 2,200 years ago the Milky Way, with its nuclear bulge, was 30° above the dawning December solstice sun. Furthermore, in our era, the two have now converged and the December solstice sun now sits in the middle of the Milky Way. 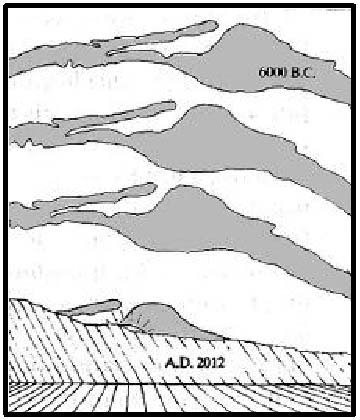 It is a period-ending event, as indicated on Stela 67, because the 13-baktun cycle of the Long Count ends in AD 2012. My main thesis is that the creators of the Long Count calendar intended the 2012 date to indicated this alignment of the December solstice sun with the Milky Ways center. In the Creation myth, this astronomical convergence was encoded as the rebirth of One Hunahpu. 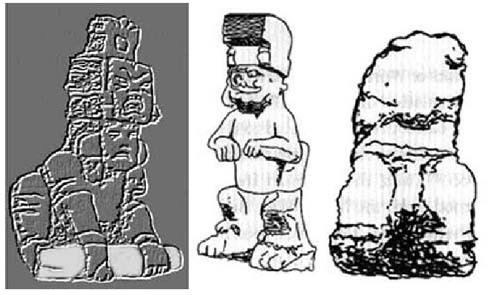 The earliest Long Count monuments are dated to Izapas heydey (first-century BC)  one at nearby Abaj Takalik and one at El Baul . . . long side arguments omitted. Well, the most compelling monuments in the Group F ballcourt revolve around position A, all of which speak to the hypothesis that the people who designed Group F were aware of the future convergence of Milky Way and solstice sun, occurring over the southeastern horizon. 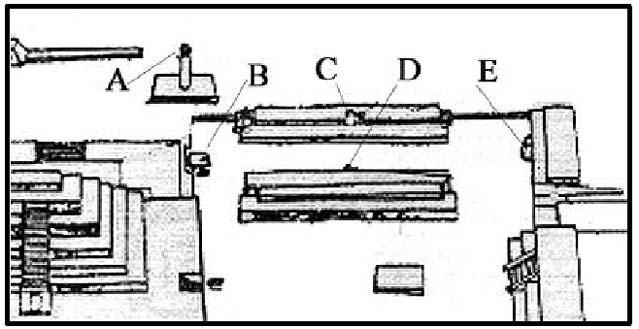 See diagram below. [Note: this throne group actually was found facing outward, over Stela 60 on the opposite end of the ballcourt; I have rotated it here for viewing purposes.] 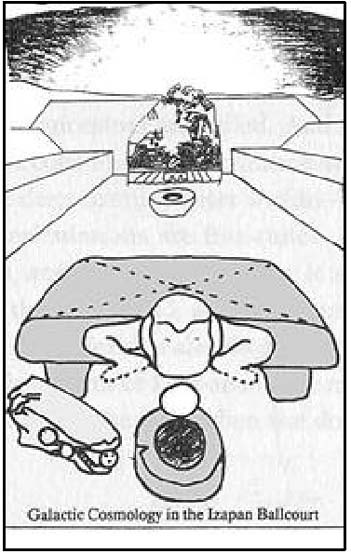 The main feature here (diagram below) is the throne, which has a head birthing from between two splayed legs this is an iconographic motif called the hocker position, indicating birthing. [Long related aside omitted that discusses throne-sitting shamans as lords, birthers, ballplayers, and conjurers.] The birth canal between the legs of the throne figure is analogous to the dark-rift in the Milky Way, a prominent feature along the Milky Way that can be seen in a previous diagram. This black cleft feature is called by the modern Quiché Maya the xibalba be (the Road to the Underworld). As translator Dennis Tedlock has shown, it plays a key role in the Popol Vuh, being also referred to as the Black Road. Generally, as an underworld portal, it is related to the complex of motifs assigned to the jaguars mouth, serpent mouths, caves, cenotes, a womans birth canal, temple doorways, and so on. A significant equation in this mythic complex is the dark-rift as birth canal, for it is through the birth canal of the Milky Way that the solstice sun will be reborn in the years around 2012. Here, the head is the sun, and the splayed legs frame the birth canal that is the dark-rift in the Milky Way. Below this head is a ball and ring, which refers to the symbolism of the ballgame. 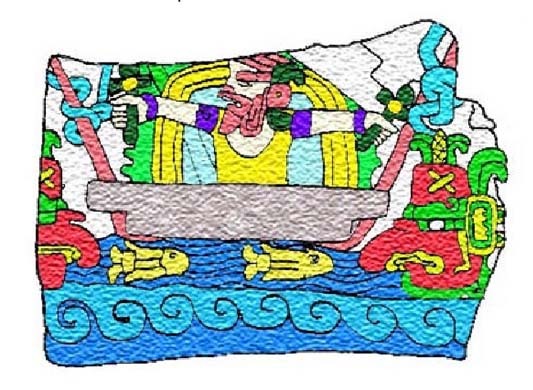 [Long argument on the cosmic symbolism of the Maya ballgame omitted, which shows how the gameball is the December solstice sun and the goalring is the dark-rift in the Milky Way.] Finally, the upside-down serpent head on the left side of the diagram above: These ballcourt markers usually had a solar lord (or "ahau" face) in their mouths; this one doesnt but it appears broken off. Again, this is the same symbolism: sun in serpent mouth is equivalent to the other symbols, all of which indicate, in three different ways, the convergence occurring over the distant horizon. Im bringing this survey to a close quickly now, even though much more could be cited as evidence for the thesis. What I have attempted to do is interpret the iconography of these monuments based upon the horizon astronomy toward which they are oriented and which they were apparently intended to encode. Ive tried to keep this brief overview simple, and I apologize for omitting so much relevant background, contextual discussion, and related evidence at Izapa. But there is nothing hereexcepting the better diagrams that isnt contained in my book Maya Cosmogenesis 2012 (1998) or my monograph Izapan Cosmos (1996). [My book The Center of Mayan Time (1995) was an incomplete first analysis.] One thing is interesting to consider: Given the integrative continuity of my interpretation, based upon a complicated set of interweaving monuments, sculptures, calendrics, and alignments, is it likely that Group F does not have anything to do with the precessional convergence of Milky Way and solstice sun? There are a few unanswered questions here: The alignment of the ballcourt is actually a degree or two north of where the sun breaks the horizon. Is this significant enough to demolish the thesis? Or can it be explained by a visual preference to a perceived horizon location as the sky begins to lighten rather than where the sun breaks free? Or perhaps by the likelihood that solstice rituals began many days before the solstice? Additional critique on my work at Izapa came primarily through the Aztlan email list, which was disappointingly oblique (opinions that the Popol Vuh does not contain astronomy were offered as arguments against my thesis; the erroneous idea that the Galactic Center is invisible; Classic-Period data was invoked to override what was going on in the earlier Izapan context; Scheles emphasis that 2012 is not the end of the world was brought up too). This last example indicates that commentators were confusing two things: The reconstruction of Izapan cosmology that I offer vs. having to believe in it ourselves. To me, it seems unnecessary to believe that the alignment of solstice and galaxy is astrologically significant for us to appreciate the cosmological system encoded into Izapas monuments, profound though it be. I have all the Aztlan exchanges, and others, in a file if anyone wants to review them. Gordon Brotherston supports precessional knowledge in Mesoamerica. Milbraths recent book provides indirect contextual support for my thesis although, strangely, she does not think precession was a factor in Mesoamerican astronomy. John B. Carlson did not want me to send him my book. E. C. Krupp initially had some feedback but now seems incommunicado. 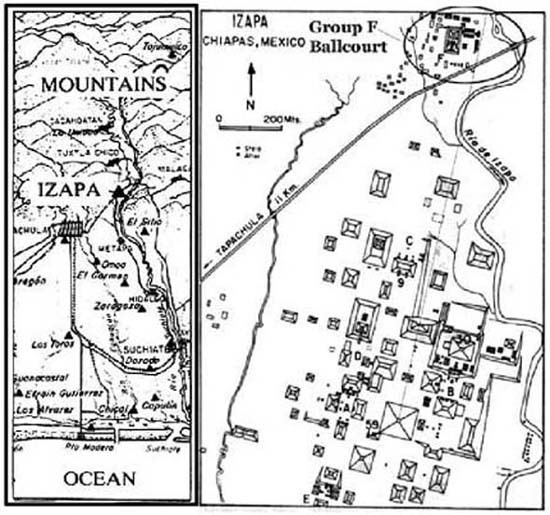 Andrew MacDonald is a Mayanist who developed a three-axis hypothesis that complements my observations at Izapa. I have read the Lowe and Norman material, but find it wanting in some respects, except for the horizon and site alignment data. Have you been able to reconfirm alignment measurements at the site? This is one thing Id like better information on. Im very interested in engaging in a dialog with someone like yourself, and would very much like to acquire a copy of your Izapa thesis (any ideas on how to go about doing that?). If you dont have a copy of Maya Cosmogenesis 2012 I will send you one. Ive tried to keep this brief, as we are all very busy people. Any feedback would be greatly appreciated, or perhaps you can pass this along to someone else who might be able to respond. Thank you for your openness and time.